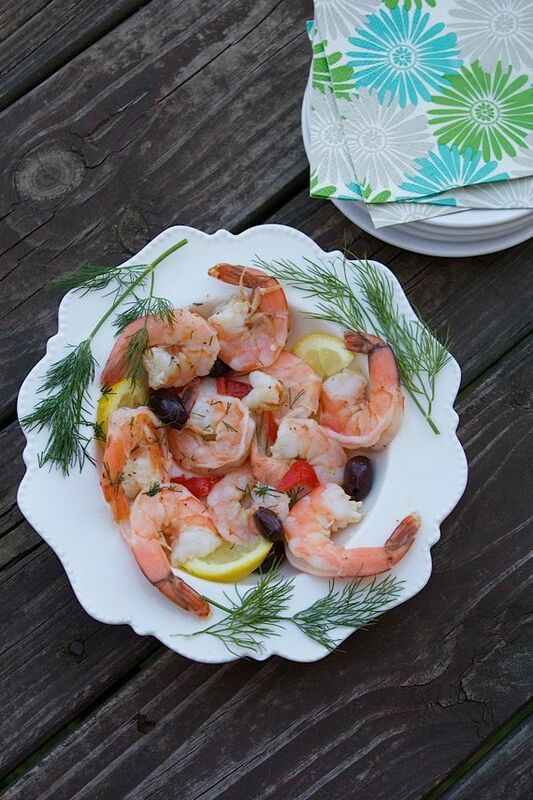 Easy shrimp appetizer with olive oil, lemon, dill. Serve with crusty bread or with a salad. Boil water in large sauce pan. Add old bay seasoning. Add in shrimp and when water returns to boil, remove shrimp. They are done. Cool shrimp. Peel shrimp. You'll find the shells will come off easily. Leave tail on. Drizzle with olive oil, lemon juice. Season with salt & pepper Add olives. Sprinkle with dill. Arrange on a serving dish. Add more olive oil if needed. I added in spicy peppadew peppers, but you can also use crushed chili pepper.